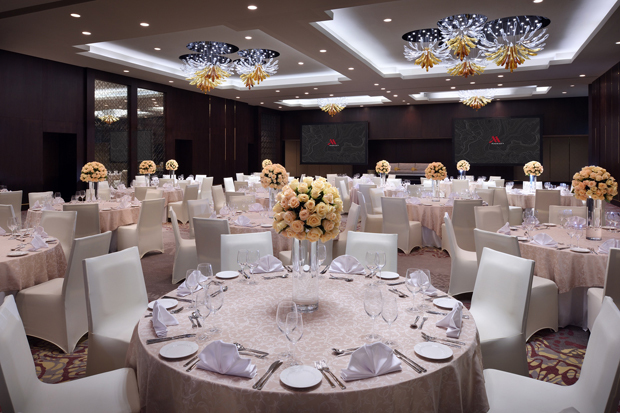 Located in heart of downtown Abu Dhabi you’ll find the luxurious Marriott Hotel an ideal wedding venue. 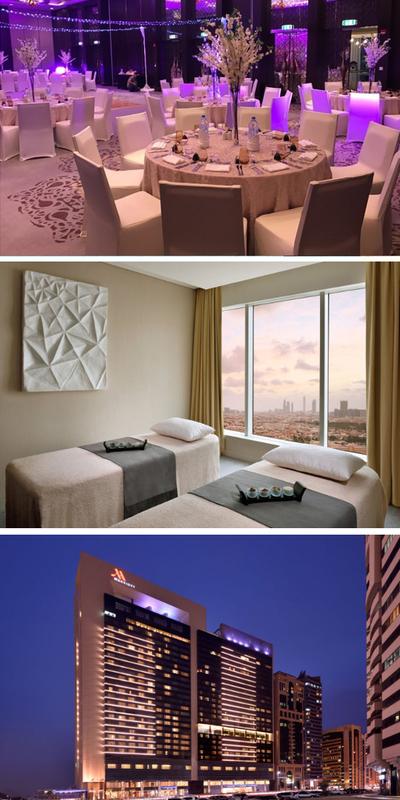 The Hotel is designed with bold colours & dramatic lighting which give a chic and modern setting. This venue also hosts a variety of spaces for events including a grand ballroom & a junior ballroom. In addition to all this, there are top dining & entertainment areas such as the JW Steakhouse & Kubara to name a few – perfect for pre-wedding events. On top of all this (literally) there is a roof top pool & lobby area where you can relax, unwind and take in the views. 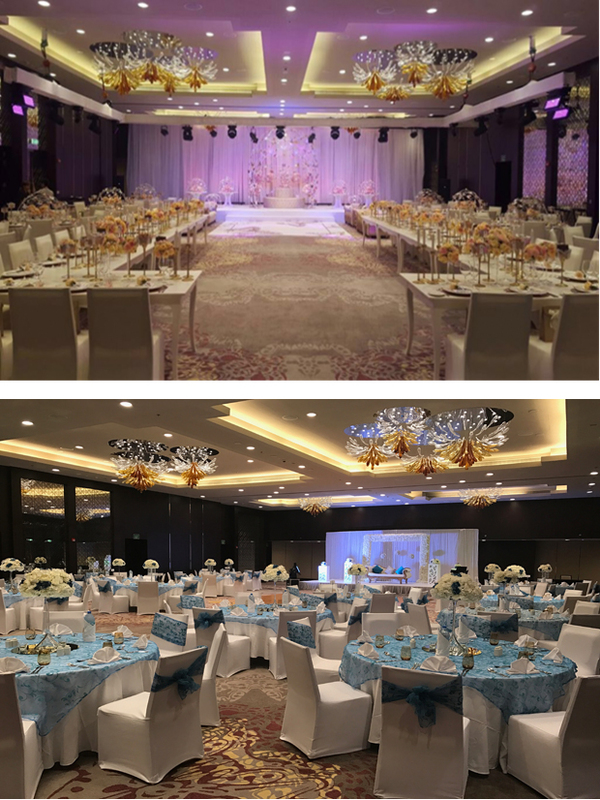 We were delighted to catch up with Saliha Alalou, Wedding Planner from the Marriott Hotel Downtown Abu Dhabi to give us more insight on this perfect wedding venue. Why are weddings at Marriott Hotel Downtown Abu Dhabi so special? At Marriott Downtown Abu Dhabi we are looking at every wedding individually. 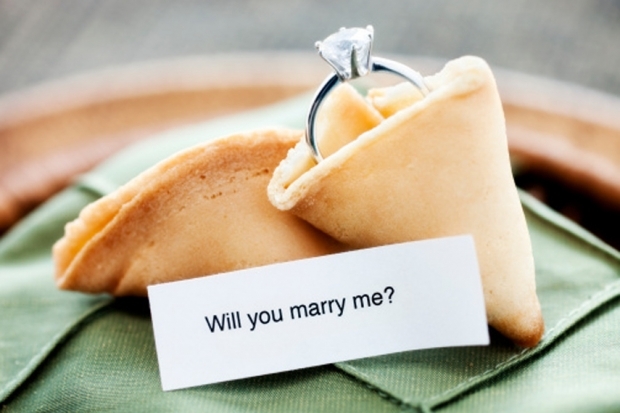 Whether a traditional wedding or a one-of-a-kind ceremony created by you, we will ensure to exceed every expectation. With inspiring venues and creative menus to an exceptional Weddings team, Marriott Downtown Abu Dhabi offers everything you need to make your big day an affair to remember. Are there venues in your hotel to suit every type of couple? 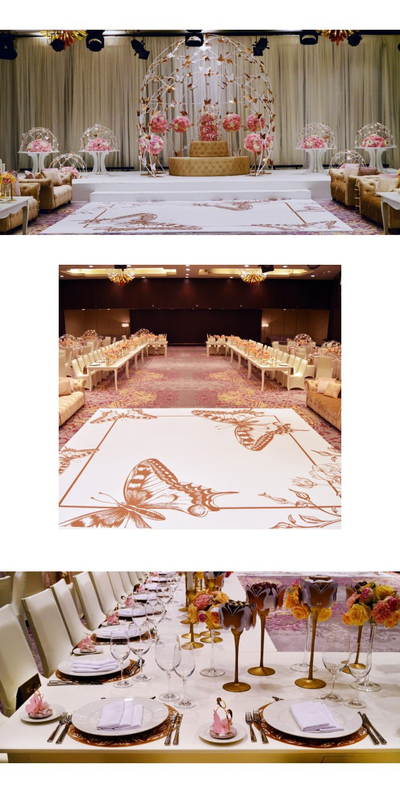 The venues in the hotel are like a blank canvas, which can be customized to fit every celebration. 3.Which venues in your hotel are the most popular for weddings and are there any hidden gems? Being new to the city and located in downtown Abu Dhabi, we have gained a good reputation in the market. Our Grand Ballroom is most popular amongst Arabic and Asian wedding guests. With space for up to 220 people and a kosha/stage, this is perfect for a grand celebration. The feedback we often receive from our wedding couples and guests is that the ambience is very intimate. A hidden gem is our Bani Yas space, which is perfect for Henna Ceremonies and all male weddings for up to 80 people. It is a very private space for intimate celebrations. How do you help a couple create their perfect wedding? Weddings are always exciting times. To make sure the bride and groom’s day is as memorable as possible, we offer a special team to listen and take away the worry of their big day, allowing our guests to relax and enjoy. What additional wedding services do you offer? We offer special spa days to prepare for the wedding as well as an overnight stay for the bride and groom after their big day. Any of the guests from overseas can enjoy 20% off our Best Available Room Rates. We also offer guidance on other wedding suppliers. What’s proving really popular when it comes to weddings right now? Celebrations before the actual wedding day – like spa days, henna nights and for the more western couples bachelor parties. What advice would you provide couples during their wedding planning? It is YOUR big day, so make sure you follow your dreams, not others’. And don’t worry too much, we will ensure to keep you on track every step along the wedding journey. Can you sum up weddings at Marriott Hotel Downtown Abu Dhabi in five words? I think we only need one – Unforgettable – Settings by Us, Inspired by You. JW Marriott Marquis Dubai | Say ‘I do’ at the World’s Tallest 5* Hotel!